Tank-Depot’s water tank experts have scoured the nation to find the best values in rain water collection for you. We offer the best selection of rain barrels anywhere. Looking for a stylish 50 gallon rainwater barrel? We have it. Do you require a large underground rain water storage tank? 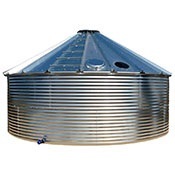 Tank-Depot is the world’s leading supplier of high capacity water tanks. 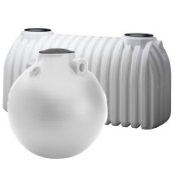 Perhaps you are looking for a decorative unit such as the Nino Series Rain Barrel. Or you want a jumbo rain catchment system? We offer all the components needed to put together a complete state-of-the-art rainwater collection system. As water become a more precious and expensive commodity, many people are turning to rainwater collection. Local populations consistently grow but, unfortunately, the local water supply usually does not. Conservation efforts can lead to dead lawns and limited access to water. A simple way to increase the amount of water at your disposal is through the use of a rain harvesting system. Whether utilized as a main water source or as a backup, rain collection provides a free source of fresh water. This reduces reliance on the municipal water supply and the costs associated with it. Additionally, rain collection can abate drainage problems along with soil and foundation erosion from storm runoff and water pooling. Rainwater can be used for a myriad of indoor and outdoor purposes: from washing the car, pets, and laundry to bathing and drinking, depending on the purification system and local regulations. Rain harvesting systems are durable and easy to install and maintain. Rain harvesting increases self-sufficiency regardless of setting: urban, rural, arid, wet, commercial, or residential. The Tank-Depot offers a wide range of collection systems to choose from for flexibility in implementation into existing structures or the design of new construction. Offering rain harvesting solutions from companies like RTS, Snyder, Graf, Bushman, Nino and more, you are sure to find the perfect product to meet your needs. The Tank Depot’s rain barrels are the perfect solution collect and store rainwater for non-potable use. 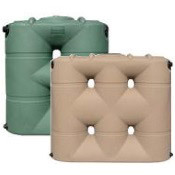 Rain barrels come in a variety of colors, most commonly seen in green, white, black, and brown. Generally, they are opaque to minimize exposure to light in order to slow algae growth. They can be decorative or purely functional in style, and sizes usually range from 40 gallons to 80 gallons. They are great for conserving water, energy, and money, since water will not need to be purchased for outdoor watering. Collected rainwater is perfect for a number of non-potable, water-intensive activities like watering plants or washing windows, pets, and vehicles. Made from a variety of materials, rain barrels can be used year round, and are commonly positioned under downspouts to collect water draining from the roof top. Many barrels come with screened lids to limit debris from entering. The hose shutoff valve imbedded in most barrels allow the filling of watering cans or the connection of hoses for direct watering or to chain barrels together to increase capacity. Rain barrels make a sound financial investment as they provide access to free water after initial set-up costs. Consider, a 1,500 square foot house could collect over 800 gallons of water for every 1 inch of rain. 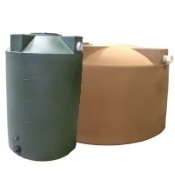 With level monitors, pumps, filters, diverters and more, The Tank Depot also offers a full range of accessories to transform your new rain barrel into a full rainwater collection system. 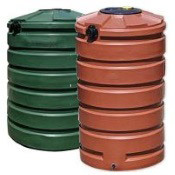 With a wide variety of sizes and styles to choose from, The Tank Depot is sure to have the right rain barrel for you. Sky rocketing water consumption along with our changing weather patterns, means it is everyone's responsibility to conserve water. Collecting and storing rain water to irrigate your lawn and garden is a great way to do your part in helping to preserve our environment.